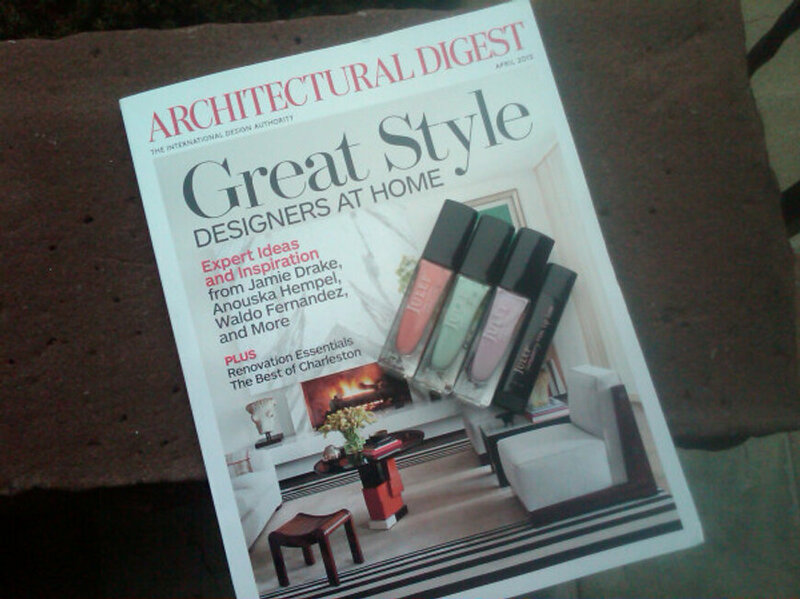 This afternoon, my subscription to Architectural Digest finally arrived. I'm always looking at their material online, so it's nice to have the real deal at my doorstep. In the mailbox was also my latest Juelp Maven It Girl box featuring some lovely colors for spring. Getting things in the mail makes me so happy. This month's Julep box was beautiful but I do have similar colors (of course I do). I need to do some spring cleaning and narrow down my polish collection a bit (or a lot). I have about 400 bottles right now and that figure contains way too many dupes. Maybe when I get an Instagram (I still have to find the patience to save the pictures from my BlackBerry, otherwise I would have gotten an iPhone a long time ago), I'll open a little store. There's always eBay as well. I have lots of goodies that aren't getting the attention they deserve. Reasonably priced to a loving home. Possible names for my store? I have a few ideas. Giving a name to something is also a favorite thing for me to do.